Twas the night before Christmas and all through the house, the mama was as busy as a determined little mouse. She was wrapping the presents and filling the stockings - making sure everything was just right. When she finished her tasks she was pleased with herself and lay down for a long, winter's night. When suddenly a loud rumble awoke her! Could it really be Santa's big sleigh? for she had forgotten to eat today! She smiled knowingly and went back to sleep, dreaming of holiday floats. For in a few hours she could wake up and devour her overnight oats! Every year at Christmastime I try to think of something to give away to friends that isn't a sugary treat. I'm not sure why I do this since I love to sample all the sugary treats that my friends and neighbors bring over! However, I think it gives me some sort of satisfaction to share something I love with those I love, and I LOVE healthy foods! I love whole grains, I love fruits and veggies in their natural state, I love foods that are full of vitamins and nutrients, I love foods grown fresh in our garden, and I love foods that just make you feel good. I suppose that at Christmastime I want to pass that goodness onto others. I don't always make food to give away. Last year I ended up making coconut-oil-sugar-scrub for the shower that smelled like pine trees. The year before we made eucalyptus-juniper berry soaps. And the year before I think we just escaped a house fire so didn't make anything at all. This year I decided to make jars to give away of my favorite breakfast ever! 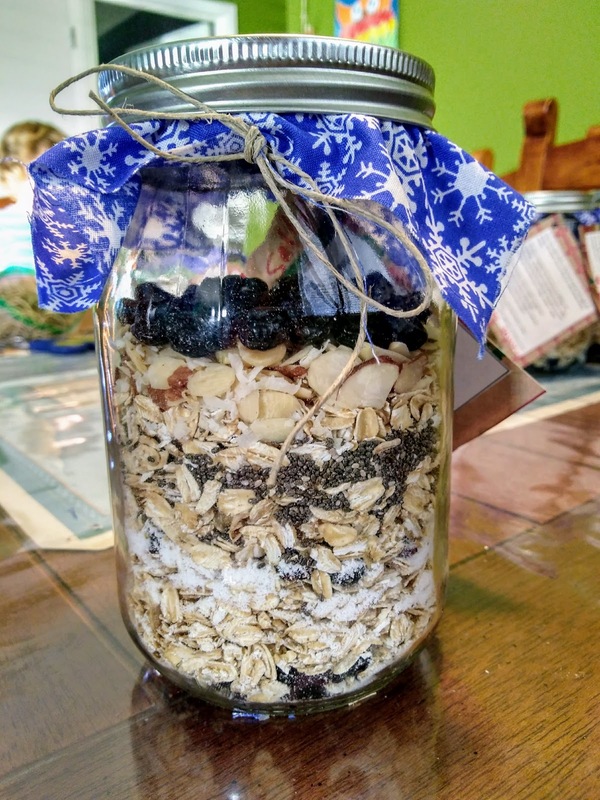 : Overnight Oats! I wrote that cheesy poem to go along with it, and voila! 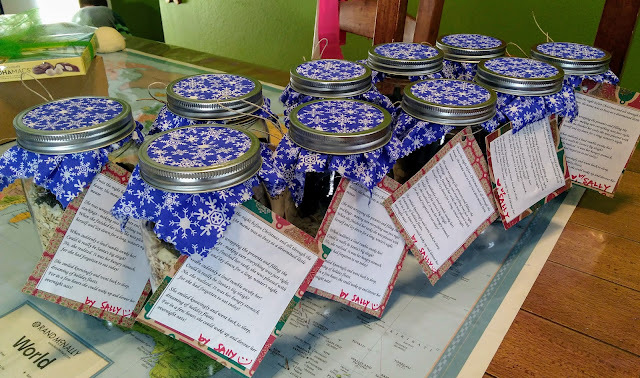 Christmas gifts that are healthy and make me feel good to give them away.